I’m working on some of these pearls and the one below reminded me of a question I’ve had. Would what your father said below (I’m really just thinking about the “Get out of debt” part) also apply to low-interest and long-term debt like a mortgage? For instance, if someone could pay off their mortgage in advance but would rather use that money to prepare for the future (i.e. retirement, education for their kids, or whatever) – would that be ok? Or perhaps there is not a one-size-fits-all answer here; it just depends on a person’s situation? The short answer is no. Preacher Clark did not teach that you were “in debt” in a bad way if you had a car or a house loan. However, if you were unable to make your payments on time, it was obvious that you were in debt, as he was speaking of debt, and needed to get your affairs in order (e.g., sell what you have, and then buy a smaller house or a cheaper car). The debt he was speaking of had more to do with discretionary spending. 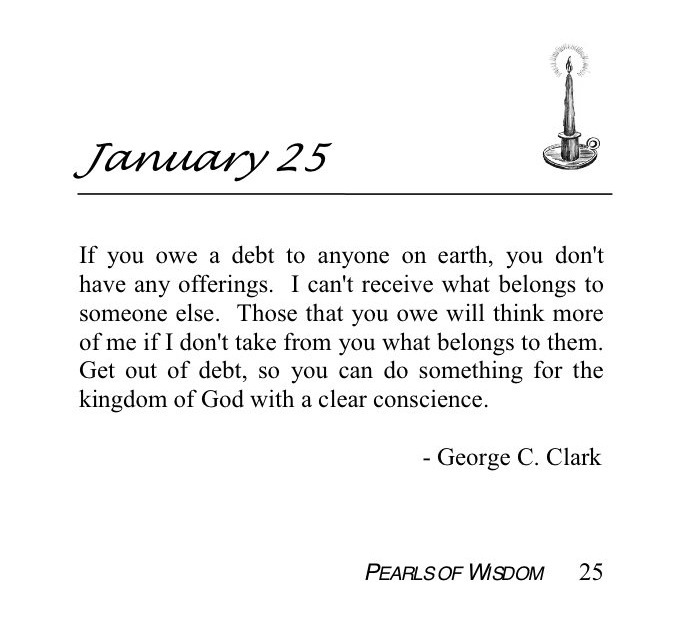 He taught us that if anyone borrowed money to buy unnecessary things (including Christmas presents), they needed to pay those debts off before they brought offerings to the Lord. He would not even allow anyone to become a part of his work in Christ if they were in that kind of debt because of such purchases, unless they began a sincere effort to get out of debt and were committed to living the kind of life that avoided wasteful spending in the future. I just want to say last night’s meeting was wonderful. Everything we needed was offered by Jesus last night: your teaching/food on perfection, rest, healing, anointed music, etc. We are so blessed. That touch (rest) stayed on me all night and is still here this morning. I feel very thankful. I don’t think I ever have seen you the way you were at the end of the meeting last night, Rob. You were somewhere else, not altogether with us. It was way beyond the normal enjoying of a wonderful meeting. That was so good to see! And Donna said you were like that until you went to bed! What should I say in such a case? Congratulations” is the only thing I can think of. You were touched by the Spirit of the Lord. Tonight’s meeting was just beautiful, right from beginning. “Perfection is My Business” is one of the most beautiful songs I have ever heard. Whew! I thank Jesus for letting us be in his prescence tonight. It is the presence of the Lord alone which makes any prayer meeting worth attending, Bess. Without that, what would we do? Yes, the touch of God last night was wonderful. I hope we will all walk worthy of such blessings, for God does not have to visit us as He does. Isn’t there a provision made for gifts to God’s ministers? Do you cover this in the book, and how is it different from alms? I know I’ve read or heard you say that sometimes God’s people are allowed to give gifts to their pastor beyond what is required for tithes & offerings – not necessarily monetary, but actual gifts. Also, I had this thought last night: regarding our “income”, it seems that would be considered net, while “increase” seems like it would be considered gross (or profit, minus business expenses). May just be semantics, but it seems like there is a difference. I try not to make a big deal out of it, but personally, I prefer that the people who bring me their tithes and offerings not give me any gifts, whether it be a Christmas gift, birthday gift, or whatever. Recently, as you know, most of the congregation gathered for my birthday. I was surprised with a few gifts, and if I had known there was going to be any gift-bringing, I would have sent an email ahead of time asking everyone not to do that. Of course, I appreciate the love behind such gifts from the sweet people in my life, but in the kingdom of God, it seems to me that it would be more in order for me to give them gifts, not vice versa. Actually, I do that when I feed them the word of God, and with gifts such as that, we should all be content. Technically, “gross income” is the total amount of money you earn before anything is taken out, and “net income” is what is left for you after all deductions are taken out. That is standard terminology for describing income. Biblically speaking, your “increase” is what you earn that really does increase your wealth on earth. That is your “net income” because that is what is left for you to spend as you will, after all deductions are made. John, I believe this Pearl of Wisdom [below] is the sober “other” side of your message on a “perfect heart” from Wednesday night. What your father described here is an NON-perfect heart. One thing I was thinking of, when I was listening to your message Wed. night, was “Lord, don’t let me be deceived into “thinking” I have a perfect heart, if I don’t.” What your daddy said below kind of put into “real life” what I was considering. The wonderful side is that God will be standing with us and work everything out if our heart is perfect, but the other side is, that if our heart is NOT perfect…. 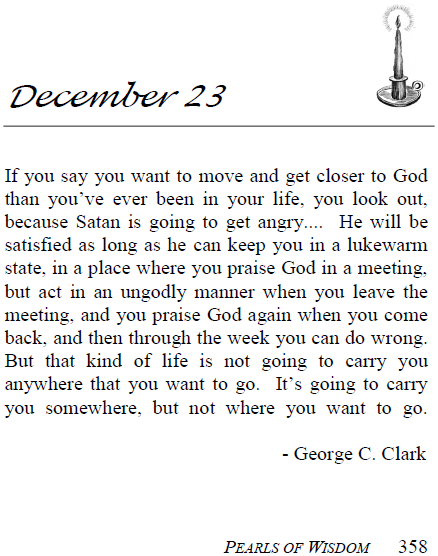 well, this was a good description of that: “if we are lukewarm, it will take us where we don’t want to go”. God has a perfect heart and gave us the Spirit that writes it on ours —- oh, the value of guarding that which He has given us, and keep it perfect and free of impurity and hypocrisy. I just wanted to share how your message blessed me in the meeting last night. The feelings have stayed with me all day. I was driving to lunch today thinking how wonderful last night was and this thought came: “Spoken words go to the ears, but anointed words go to the heart.” Everything you were saying last night went straight to my heart. As soon as you started talking about the “perfect heart” and what defined it according to God, I began to feel a fullness coming. All the wonderful examples you gave of Abraham, Moses, David, Peter, and Paul (I felt like Preacher Clark could have been added right in there, too!) The best I can tell it, is that I felt your message working from the inside out. There was such a sweet anointing in your words that they were like honey pouring into my soul with a love and encouragement that does not come from just “spoken” words, but anointed words that bring about the feelings of God stirring inside. All I could do was sit with my heart opened wide and feel the love of God pour in (and pour out through my eyes). It was such a sweet invitation to just open the doors of your heart and let Jesus cover you with his love. I loved what I was feeling and left the meeting wanting to come home and just get still so that I could hold on to it. The love and healing I felt in your message, Bro. John, was just what you said (paraphrased): There is no need to be afraid. God can take our “messes” and turn them for our good and make us better servants for Him if our hearts are pure. What an amazing love! I think Jesus did more last night than we know. I’m feeling really thankful right now. I have read so much about how “people are struggling to redefine happiness as traditional roles and values change” (the sentence always goes something like that), but it always leaves me with a sad feeling. I realized just now that I don’t have to “struggle to redefine” anything because the spirit in me tells me what’s either right or wrong. What a big deal! It seems way less exhausting. True happiness does not have a definition. It never has had one. Happiness is altogether a feeling, a matter of the heart and spirit. It’s substance is not something that any dictionary can capture. Happiness is the fruit, the end result, of making right choices and living a truly good life. I am not surprised that college professors and social engineers are now are trying to define happiness, and to define it in a way that denies this confused generation’s need of it. In what Jesus called “a sinful and adulterous generation”, happiness is lost. Some generations in the past also lost their happiness through foolishness and sin and then regained it by humbling themselves to God and changing their lifestyles. But a generation that adds stubbornness and pride to its sinfulness refuses to change, or even to admit they need to. Instead, they just claim to be happy, and define happiness in terms that their unhappy hearts can meet. But we cannot make ourselves truly happy by claiming to be happy. Happiness is a gift from God, not a work of man. It is far beyond the power of man to bring about his own judgment or to determine what he will reap for what he sows. We can, for certain, choose how we will live, but after that, we have no choice at all. God alone is Judge of our deeds, and unfortunately for the wicked, He is a righteous one. Thanks for writing, Beverly. Keep traveling the road you are on. Jesus has given you wisdom beyond all your teachers.